As you read this, I am actually spending some time in France, so the question you may rightly ask is : Is the 2CV a time machine that we've used to commute between hemispheres, or is there something wierd going on with the alignment of the planets? 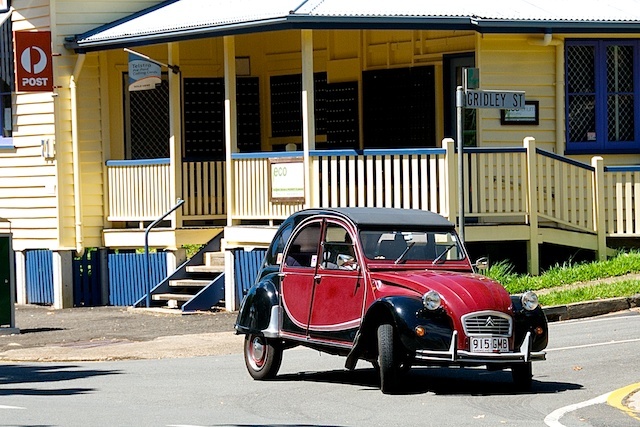 This is such a good composition, in that you have totally located this 2CV in Queensland. Firstly, the post sign locates it is Oz, and then the building screams QLD. There are few things that can evoke previous years like a 2CV, and to see one here I should think to be quite a rarity. Thanks Julie, the more I hang out with my camera, the luckier I get I think. 2CV's aren't all that common in France any more either. Could have something to do with my post about the time-thieves. 2CV's have class and character - Love this shot - sort of Queensland with a twist of La Belle France!